Finding a bee nest in the evergreen bushes that are such an integral part of the landscape can be disheartening at best and dismaying at worst. Bees come with a negative connotation, conjuring up images of swarms out to sting those who walk too close. While some bee colonies should be removed, some are beneficial to the garden and can be left alone if not positioned too close to a high-traffic area. The first thing to do is to identify what kind of bees have made a nest in the bushes. Not all bees build elaborate nests, and some live a very solitary life; the presence of the nest itself will help narrow down what kind of bee it is. Bumblebees are a common type of bee found nesting in areas with plenty of flowers. These bees have a distinctive oval shape with a striped yellow and black pattern -- a classic bee appearance. Honeybees will also nest in trees and bushes and are typically about 1/2 inch long with yellow and golden-brown stripes. Killer bees are the bees that are in part responsible for the images of swarms chasing people, which they are well known to do. These bees can nest almost anywhere and are similar in coloring to the honeybee save with darker brown stripes. Bees are responsible for a large portion of the pollination process that many plants require to reproduce. Bees -- particularly honeybees and bumblebees -- land on flowers to feed, picking up some of the pollen and transferring it to another plant when they continue on their way. These bees can be particularly helpful to have around, especially if the evergreen bushes they have made their nest in is near fruit trees or gardens. Many orchards have hives for bees to keep them content and on the property strictly for their pollination capabilities and help creating more succulent fruits than the trees could on their own. These types of bees have been found to be rapidly declining in numbers. Parasites and mites have decimated many nests, making a honeybee or bumblebee colony an important addition to any urban or rural area. The killer bee, also known as the Africanized honeybee, is a hybrid species of bee that has been responsible for much of the bad press that the bee population receives. Originating in South America, these bees are expanding northward yearly and are very similar to regular honeybees in appearance. These bees work together in large swarms to build nests quickly, and they also reproduce quickly. A killer bee nest nestled in the evergreen bushes near any civilized area should be viewed as a threat to those near it. The bees can survive on very little, are easily aggravated and will attack in swarms known to chase people for some distances as well as to be responsible for upwards of 1,000 confirmed deaths. 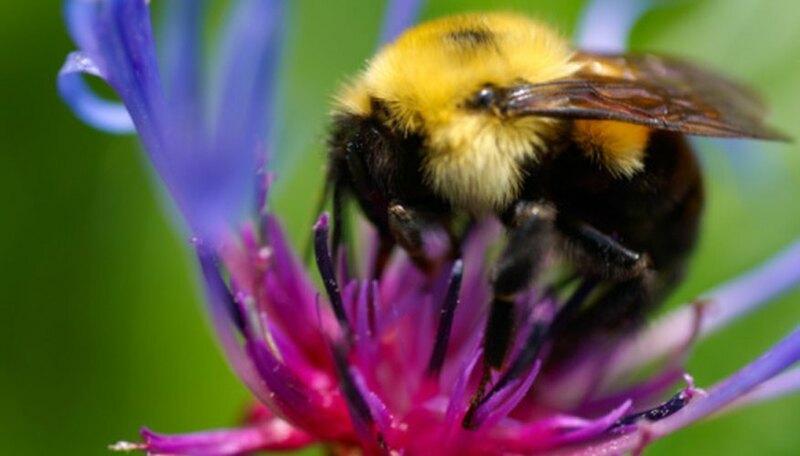 The nests of honeybees and bumblebees need not be removed unless they are located in a high-traffic area or if individuals in the nearby area suffer from allergies to bees. In these cases, protective clothing, including gloves and goggles, should be worn while spraying the nests and the surrounding bushes with a pesticide developed specifically for bees. Once there is no more activity around the nest, it can be cut from the bushes and disposed of in a garbage bag. Cold weather will also kill off a colony, so if this is right around the corner, waiting for the natural death of the colony and then disposing of the nest may be easiest. Killer bee nests should only be disposed of by professionals, and the existence of one should be reported not only to an insect control officer but also to a local college extension office as killer bee movements are often tracked.